You are here: Home / Saunas / Portable Saunas – A Way to Enjoy a Spa Experience at Home! Portable Saunas – A Way to Enjoy a Spa Experience at Home! Saunas are a common fixture in many spas, fitness centers, and other health-related facilities. Interestingly, saunas have now managed to find their way into many homes, thanks to the availability of portable saunas. Still quite new on the market, portable saunas are fast becoming popular because of the ease of use. They run on infrared technology. They may heat differently as compared to a traditional sauna but are equally effective. Their affordability and ease of use make them a good choice for homeowners. You can find portable saunas made of wood frames, metal frames, and even moisture-resistant satin polyester materials. Powered usually by carbon fiber infrared heater panels, portable saunas are quite energy-efficient too. 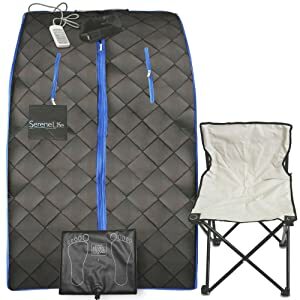 Depending on the brand you choose, you may also find saunas with a portable chair included in the package. While not the same as traditional saunas, portable home saunas still help you sweat more and reap some amazing health benefits as well. For instance, it helps you burn additional calories that will lead to weight loss. The regular use of portable spas may help flush toxins out of your system and improve your overall health. Detoxification can also help improve the quality of your skin. It also helps relieve stress and reduce pains and aches at the same time. In addition to health benefits, there are other good reasons to buy a portable sauna. For instance, you can use it in the comfort of your home. It is easy to dismantle it and store wherever you want. Moreover, you do not need to stick to a schedule to use your sauna. Portable saunas have their benefits, but you should know what to consider before making a purchase to maximize benefits. Heat: One of the major differences between the two types is that traditional saunas can get as hot as 185F or even 195F. Infrared saunas, on the other hand, maintain a relatively milder temperature environment of between 120F and 150F. Keep in mind that lower heat does not make infrared saunas less efficient because their heat travels deeper into the body. Therefore, infrared saunas can cause a vigorous sweat even at lower temperatures. Power Requirements: Traditional saunas require more overall power to function as compared to the infrared Most infrared saunas can function well at 1.6kw, whereas traditional saunas require 6kw to work. It implies that a traditional sauna is almost three times as expensive to use as an infrared sauna. Action: A traditional sauna makes use of a stove to increase the temperature of the air around you. An infrared sauna used infrared heaters to produce infrared light. These infrared waves penetrate into your skin to raise your body temperature. Therefore, you can experience the effects of a traditional sauna from an infrared sauna with less overall heat required. Speaking of portable saunas, here are a number of options you will find in the market. Designed to enclose your body but leave your head outside, a sauna cabinet comes with a zippered enclosure with infrared heaters. You will be sitting on a chair in this fabric-lined enclosure. There are slits in the compartment that allows you to keep your hands out too. The main advantage of using this type of sauna is its portability. You can take it anywhere you go and set it up with utmost ease. It is foldable too, so you do not need a lot of storage space either. With your head outside the compartment, it is a suitable choice for many people who feel claustrophobic in saunas. They are not as portable as fabric-enclosed saunas, but they look stylish and are highly effective too. You can opt for one such sauna if you have enough space available in your home. Some of the most common components of these wooden cabin saunas are the bench for seating, adjustable temperature, lighting, carbon/ceramic heaters, vents, and tempered glass doors and windows. In most cases, these saunas have a removable duckboard in place of a built-in wooden floor. Therefore, it may be a bit tricky to keep it clean. Wooden saunas are impressive, but they may not be suitable for people with limited space and a tight budget. Usually lined with heavier material than fabric, a sauna dome is mainly a tubular enclosure that you lie in to raise your body temperature. Some sauna domes use fabric. They are quite portable because they usually weigh no more than 30lbs. Others are made of durable materials, such as mahogany and are not as portable because they weigh more than 80 pounds. 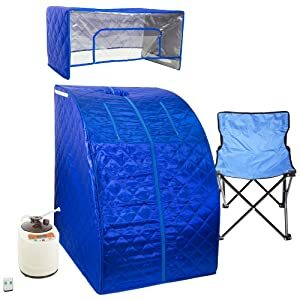 They are rather expensive as compared to those portable fabric-enclosed saunas. But they may suit some people more in terms of functioning because they do not enclose the head. As mentioned already, portable saunas are of different types, and they may use different sources of heat. Mostly, you will find saunas that use carb fiber heating panels. Infrared saunas usually use this heating source – it is the same for both portable and stationary saunas. You can also find portable saunas with infrared heating zones. They also utilize the same carbon fiber panels, but unlike the other type, it is possible to control these panels separately. It means that these saunas allow you to set different temperatures for the top and bottom half of your body. Before finalizing your buying decision, do not forget to check the maximum temperature of different types of saunas. Some people believe that they get the right sauna experience when the temperature is extremely high. Keep in mind that portable saunas may reach a maximum temperature of 120F. Some others may be good enough to touch 150F. Due to these variations, it is important to check this point before you go ahead with your decision. If saunas can make you feel claustrophobic, you should pay special attention to selecting the right sized sauna for you. You will be cramped for room in saunas that let you lay down. Saunas that keep you seated are likely to feel more spacious and less claustrophobic. So, consider this important point when going through the range of portable saunas. Portable saunas may come with a set of additional features. Some of them come with heating footpads, while others do not. Using heating pads may help make it easier for you to raise your body temperature. Similarly, some other saunas may come equipped with features, such as washable neck collars, holes for your arms, wireless remotes, and pockets for your phone. It is important to note that not all saunas come with a chair. When buying, be sure to check if it is included in the package or not. You may also want to consider how comfortable the seat is. Even some of the most popular brands offer chairs that fail to keep you comfortable throughout your sauna session. Hygrometer and thermometer: You should consider investing in a thermometer to keep an eye on high hot your sauna gets. Similarly, a hygrometer helps keep track of humidity. Keeping an eye on both temperature and humidity significantly enhances your sauna experience and keeps you safe too. Signage: You may want to invest in it if you have people not knowing how to operate the sauna properly. You can simply hang it on your wall for easy viewing. Upgraded Flooring: Your sauna will come equipped with standard flooring, but you may or may not find it efficient enough for you. Sometimes, it makes sense to upgrade to the plastic material, which is more comfortable and safer too. It also lowers the risk of slipping. To make your endeavor easy, we have reviewed some of the best products after extensive research and consider reader feedback. In other words, these very products are used and recommended by many people like yourself. 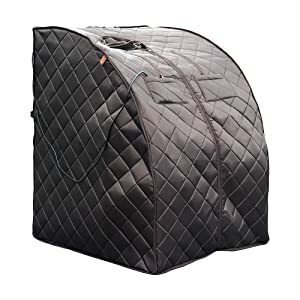 This portable home steam sauna is a great choice with sufficient space available to set it up. 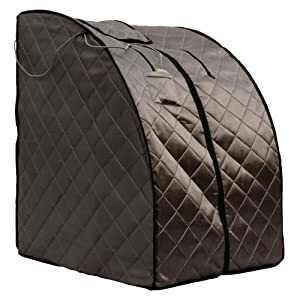 It is 33-inches wide and 43 inches high, so it is much more portable than many other steam saunas in the same category. You will see it equipped with a good 800w steam generator that works quite efficiently. The interesting thing is that the generator comes with a hose and you can change its direction to direct steam towards your body. The maximum achievable temperature is 120F, so it may not be for if you like your saunas to be extremely hot. While it performs well, it feels that the construction is not up to the mark. Other than this, there is nothing really wrong with this steam sauna. The SereneLife Portable Infrared Home Spa is one great choice for anyone interested in detoxifying at home. It lets you take advantage o the sauna therapy at home. With it, you will have a highly mobile beauty spa at home. You will like how simple it is to change heat levels as per your requirements. This infrared sauna also comes with a foot mat that you can use to soothe achy muscles and prevent fatigue. Another good thing is the availability of a sauna chair. You can fold it easily and store wherever you want. We like the fact that it is possible to use it on your carpet, so you do not have to look for any special place to use it. Overall, it is a good choice, but we believe that the zipper quality could have been better. It is one of the very best portable saunas available in the market. People love it because it does what it promises and is affordable too. With three carbon fiber heating panels, the BSA6310 packs a good heating punch. The unit is quite energy efficient and heats up completely (150F) in around 10-15 minutes. We suggest you turn it on and let it heat up for a few minutes before you get in. You will find a heating pad with it that you can use to keep your feet warm. One of the reasons behind its efficiency is its fully insulated triple layer setup. There is a reflective polyester inner layer along with a satin polyester outer layer. In the middle, you will find cotton insulation for improved performance. You will have to spend some time assembling the unit. It comes with a chair that also needs to be assembled before use. The availability of additional features like holes for your feet and head and remote control make it a popular choice for most homeowners. The remote has 5 levels of heat temperatures and is quite accurate too. The only downside is that you will find heating panels on the sides only. There is none available in the front. Moreover, you may find that using the heating pad is quite uncomfortable because it gets too hot to handle. One of the most popular steam sauna today, it comes equipped with some amazing features. You will like how easy it is to adjust power and time by using a remote control. The inclusion of a folding chair is one of the reasons behind its widespread popularity. It is lightweight, so the portability is not going to be an issue. You do not have to be an expert to be able to assemble the unit. The frame looks good and sturdy, thanks to the use of heavy-duty plastic tubing. It looks strong, but avoid forcing tubes too far into the connectors, or you might end up breaking it. The chair included in the package may not be suitable for taller folks, but it is still usable. A common issue is that there may be condensation in the LED light after you empty the water canister. It is no deal-breaker though! 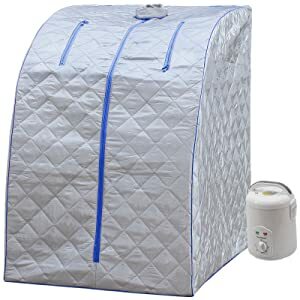 This lightweight steam sauna has a simple yet effective design. The water starts boiling in no more than 15 minutes, so you do not need to wait to start using it. There is no chair included, so you may want to use your own. Just remember that your chair may corrode over time because of the humidity. Moreover, the hinge on the crossbar can come off, making it difficult keep the front of the sauna from flopping down. Be sure to put a towel on the floor to stay safe in case the water starts flowing on the floor. Zippers are of good quality, but it is better to be gentle. You can set it up within minutes and fold away quickly for easy storage. It comes equipped with a built-in sensor that turns the sauna off when there is no water in the steamer. It comes with a 2L steam pot and to take the steam for at least 40 minutes. It gets ready to be used in 15 minutes though. It comes with different power levels. An interesting feature is an herb box that you can use for aromatherapy. There are two small zippers that help keep your hands out while using the sauna. Practice some care when setting up the resting bar or you may break it. The BSA 6315 is one reasonably good option for anyone looking for a portable sauna. The fully insulated sauna cabin is quite powerful and features a moisture-resistant, satin polyester exterior. Since it is lock-stitched, it keeps serving you well for long. Zipper hand holes make it convenient to keep your hands out of the sauna cabin. The unit supports dual exterior pockets and makes it possible to keep your phone tablet, and reading material handy. There is a strong little chair included in the package too. overall, it functions quite well, but the price could have been better. Here are some of the best accessories that can add to your overall experience. 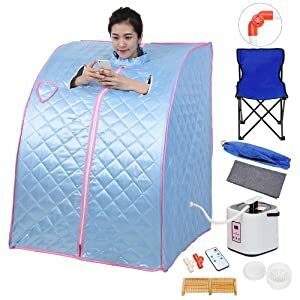 This portable sauna kit comes equipped with a chair, foot massager, and steam pot. The cotton cover has a special layer to prevent steam penetration. It has 6 levels of adjustable time and 9 levels of adjustable temperature. 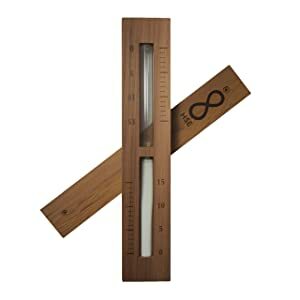 Made using high-quality red cedar wood, the time looks and smells quite good. It is highly accurate, but the maximum length of time is 15 minutes only. 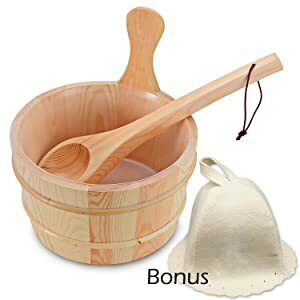 The bucket comes with wool felt sauna hat and wooden ladle. The bucket is large enough to contain 1 gallon of water. The use of 15-inch long ladle makes it easy to pour water over sauna rocks. It is a good accessory to have in your home. Once you have bought your new sauna, keep the following points in mind to use it more effectively. Take advantage of aromatherapy. The molecules in essential oils can penetrate into your skin and promote detoxification. You can opt for mint, eucalyptus, or mint to treat your blocked sinuses. Lavender is a great choice to help boost your mood. If you have invested your money in a movable sauna, you may consider using your regular chair with it. 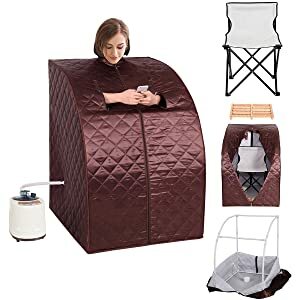 This is, of course, a good option when you do not get a chair with your sauna or what you get is uncomfortable. Avoid drinking icy cold beverages before the start of your sauna session. It can lower your core body temperature to the extent that you will have to spend more time in the sauna to sweat significantly. Be sure to drink water at least half an hour prior to your sauna session. You will be sweating profusely in the sauna, so drinking water will help keep you hydrated. You may also consider drinking Gatorade after a session to replenish your electrolyte reserves. Consider finding something to entertain you during the session. Your session will at least be 30 minutes long, so it makes sense to have a book magazine, or something else handy.